The symbol of the Indian lotus (often called 'lotus flower') has been a spiritual symbol in the East for thousands of years. The spiritual meaning of the lotus flower is, perhaps, even more relevant for humanity today as we go through tremendous upheaval in virtually every area of our lives. The lotus flower grows from the bottom of muddy streams and ponds to rise above the water and blooms in a display of breathtaking brilliance. It represents being fully rooted in the material world (the earth) yet continually aspiring towards the divine (the sun). The lotus flower lives in the muddy water yet remains unsoiled. This is the path of the human who is awakening - to work through the 'mud' of life, and rise above it - for the benefit of all mankind. We have to take the 'sticky', 'muddy', 'dirty', uncomfortable energy of our lives and transform it into something incredibly beautiful. We can wallow in the mud, or reach higher. The choice is always ours. When each of us here understands that we are, at our essence, energy expressing through a human form, then we will understand and embrace this message fully. If we cannot recognise the energetic essence of ourselves, if we are unable to find our true nature hidden behind the layers of the personality self, then we will not know our oneness with all of life, and all of the extraordinary beauty and power at our fingertips. Wake up humanity - your time has come to shine! Some places still available on our next spiritual healing and energy based courses this July and September. Book today to avoid disappointment later. Your emotions are precise indicators of where you are standing, vibrationally speaking. 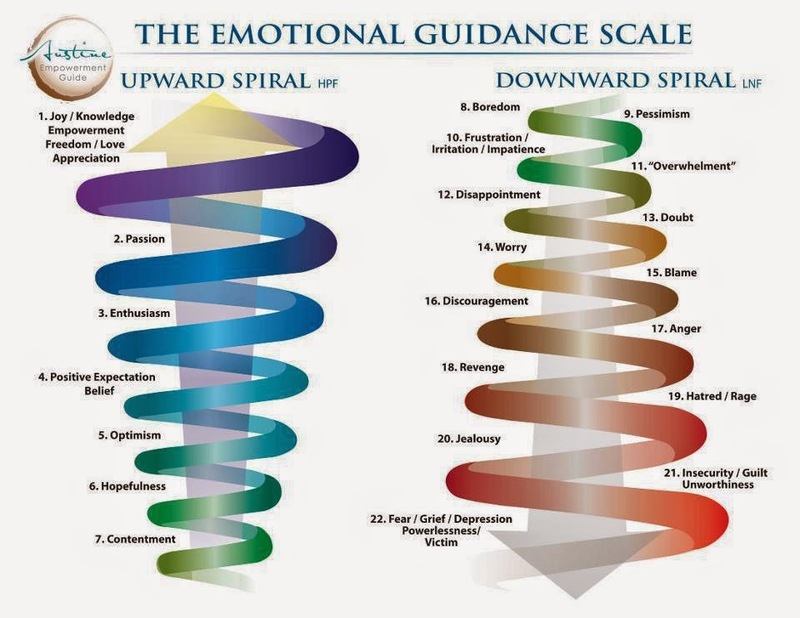 Once you understand the emotional scale* and your emotional set points, on any subject, you will be able to 'clean up' those areas of your life which aren't working for you. If you have no awareness of the inner dimensions of your reality, then it will be impossible. You will be somewhere on this scale (the words don't matter so much as the frequencies behind the words) when you focus on a particular area/topic of your life. The diagram shows the scale, split into an upward and downward spiral, but they are essentially one fluid scale. You will tend to be at the top, if that area is working for you, and you will tend to be at the bottom if an area is not working. One key thing to understand is that you can't jump from feeling grumpy, negative feelings to feeling suddenly positive and upbeat. These vibrations are too different in their frequencies. Another vital, and similar key, is that you must incrementally reach for better feeling thoughts by focusing on 'wanted'. This is not usually easy for the beginner because they are very practiced in offering an 'unwanted' vibration, rather than a 'wanted' vibration. As with all skills, it takes time and patience, along with depth of understanding. After covering the mechanics of moving up the emotional scale in class, my students were invited to go home and practice on an area that needed cleaning up. One of my students decided to focus on the area of personal relationships, as she felt she was being spoken to disrespectfully by her boss (who we will call 'Ms X'). She felt that Mis X distrusted her and often spoke to her with animosity, which was clearly an 'unwanted' situation. Contrasting, or unwanted situations, lead to clarity about we really want to bring into our lives. As my student focused on the unwanted situation, it was easy to identify the 'wanted' solution: my student wanted to be spoken to with love, respect and appreciation by her boss, Ms X. Overall, after the exercise in deliberate creation, my student felt there was some improvement in her vibration but the negative 'sticky' or 'muddy' energy was still there. Some of the energy had shifted but not all. So, during class, we refocused on the 'wanted aspects' and I guided my student to maintain consistency in moving up the emotional scale. We started from the beginning again, consciously and deliberately moving up the scale to consciously change her emotional 'set points' around this person/situation. You can call these set points "emotional triggers". In just a few statements, my student cleaned up her vibration around a situation that had been troubling her for months!! Within just a few days of changing the energy around this situation, her boss dramatically changed her behaviour towards her. This is the 'magic' of cleaning up one's energy, and one's vibrational set points. This is THE SECRET, demonstrated. Life is fluid, flexible... and ever changing. We are constantly changing but, if we keep unconsciously choosing the same reactive patterns, then nothing appears to change for us. We can demand that others change - but really, it's up to us! When we change, everything else changes. Even if it doesn't change in the way we would hope, then we find we are no longer affected by it. **Sign up for the next Law of Attraction workshop on Saturday, 5th July, in London. **Only £90 early bird (until end of May), else £110 for the day's training. **12 students max, to create an intimate setting where individuals can receive quality attention from the teacher. Jaime works with clients all over the world, and has served clients in the UK, Australia, Canada, USA, Germany, France, Spain, Italy and Brazil to name but a few countries.